In my quest to better understand the Global economy (and it's affect on teens), I dragged my family off to France and the UK for the past two weeks and tested the effects of Socialism on two girls who were raised in an entirely Capitalist system. While we're still tabulating the data, certain trends are evidend such as "public transport is amazing", "free health care, are you kidding me?" and, of course, "free college – can we move here Dad?". Jackie was very impressed that the beaches don't charge fees, Maddie is actively finding out if she can keep her 504 Plan College fund if she goes to Europe instead. Not a bad idea, really, as she's fully-funded for college but, if she takes an Advanced Learning Loan in the UK (which would require her to establish residency first), she would have her college paid for with the obligation to pay back 9% of her income over $27,000/year. After 30 years, the program terminates, whether the loan is fully paid back or not. That's a very fair way to have students pay for college and Madeline realizes that, since she already has enough money to buy a house in her US fund – she'd be miles ahead of the game. Frankly, if I hadn't wisely funded the kids' 504 plans when they were born or had the market been unkind to their funds – I would have seriously considered moving the family to Europe when they started high school becasue we're talking at least $300,000 and probably closer to $500,000 to put two kids through good schools and we too could have gotten a free house in exchange for moving to Europe. Now do you see why housing prices in London are soaring? It's my favorite time(s) of year! JPMorgan (JPM), Citigroup (C) and Wells Fargo (WFC) kick off earnings season this morning but it's a very low bar set for the banks as they have all cut their profit forecasts in the last few weeks so expectations are low – especially as the 2nd quarter is usually weak for trading. Overall, the sector (XLF) is up 10% since early June and now we'll see if it's justified or not. Q1 results, which came out in late March, sent the sector off a cliff but they've climbed back since on the same fairy-dust that's powering the rest of the bubble. JPM missed, WFC missed and C beat but C reduced their loan-loss reserves from $12.3Bn to $12Bn, something banks can do "because they feel like it" and that effectively popped their bottom line by $300M. C's outstanding loans was up 2%, to $645Bn so the reduction in reserves is C telling us that they don't feel more than 1.86% of those loans will default while the industry standard is 2-2.5% or $12.9Bn – $16.1Bn so, effectively, C is goosing their bottom line by $900M-$4.1Bn by simply pretending their loans (student loans, sub-prime auto loans, retail store loans) are the safest in history! JPM dropped their loan-loss reserves to $1.22Bn from $1.4Bn, adding $178M to their "earnings" and, if that seems a little thin to you, consider that they did, in fact, write down $1.2Bn in loan defaults in Q2 and that covers just 0.56% of their portfolio, down from 0.79% in Q1. 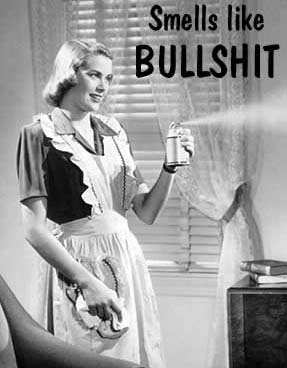 At least WFC is honest about it, saying "Net income increased $315 million, or 15 percent, from second quarter 2016, primarily due to the tax benefit in second quarter 2017 and lower loan loss provision" but, then again, it's kind of hard not to mention a $450M decrease in your loan loss reserves! For those of you keeping score, that is % of their earnings. WFC now has $11.073Bn provided for on $957.42Bn in loans or 1.15% – that'd double JPM's joke of a reserve but half of Citi's. 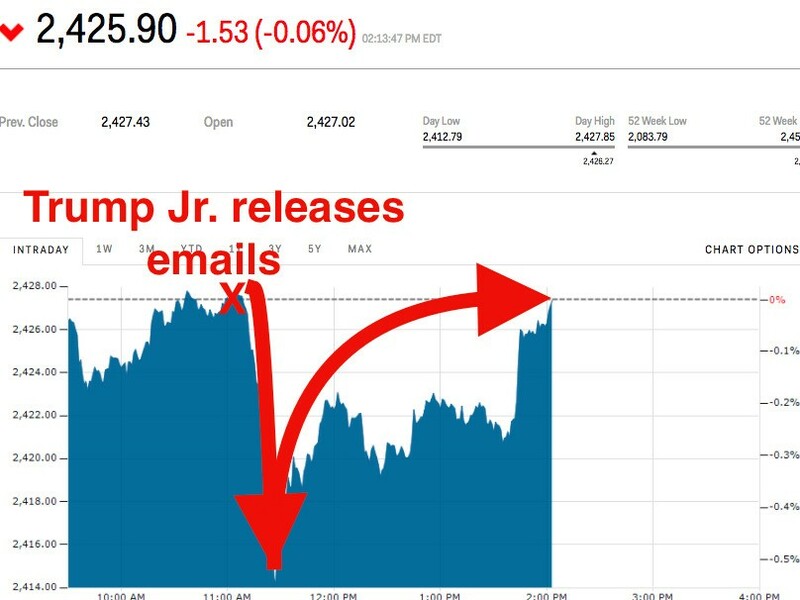 The markets will go down again now. The reason doesn't matter – just that 2,440 is our magic number at the top and it's been a reliable shorting line since early June. Yellen's testimony yesterday was a very silly reason to have a rally – she said the same things she's been saying all year, neither more hawkish or more doveish than she was when the S&P was 10% lower than it is now. On the indexes, 2,440 on /ES is our current shorting spot and we can see that's going to line up with /YM 21,500, /NQ 5,775 and /TF 1,425 so we WANT to short /ES at 2,440 as long as the others aren't breaking over and if ANY of them break over, we stop out of /ES and wait for at least 2 of them to cross back under and then short the laggard. The Nasdaq plowed up to 5,800 but the other indexes are right where we want to short them and the Russell (/TF) is our favorite short, at 1,425, moving $50 per contract (we prefer 2) per point in our favor. "A foreign national shall not, directly or indirectly, make a contribution or a donation of money or other thing of value, or expressly or impliedly promise to make a contribution or a donation, in connection with any Federal, State, or local election. "A solicitation is an oral or written communication that, construed as reasonably understood in the context in which it is made, contains a clear message asking, requesting, or recommending that another person make a contribution, donation, transfer of funds, or otherwise provide anything of value." 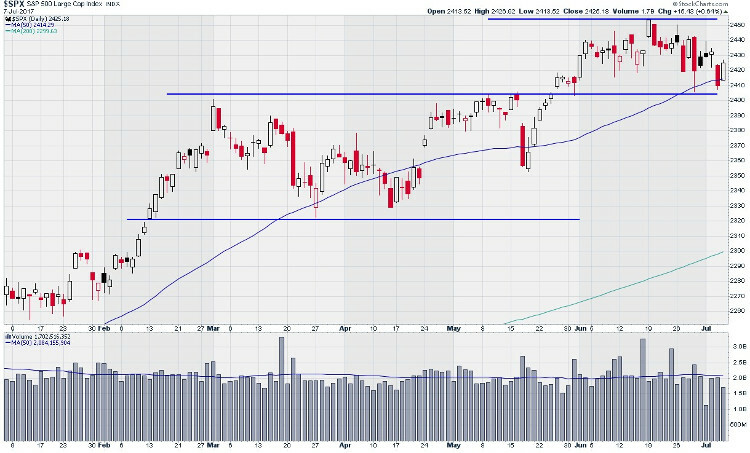 As you can see from the S&P 500 chart, we're still in that range that tops out at 2,440 but we've held 2,400 so far for June so still generally bullish but now the 50-day moving average has caught up with us at 2,415 so we can no longer be satisfied with anything less and there's really no proper support below 2,400 – all the way to the 200 dma at 2,300 (a 5% Rule™ drop). Now we take that off the table and look for either a fresh horse or, because the indexes all look toppy now, look for a possible reversal. /NQ 5,700 is very likely to be rejected so that's a good line if /TF is below 1,420 and /YM below 21,400 and /ES below 2,430 (which indicates they all failed their next breakout). So shorting /NQ with the stop above 5,700 is the most likely play now. As you can see on the Nasdaq (/NQ) chart, 5,700 has remained a good shorting line and, at the moment, we're down more than 10 points at $20 per point, per contract so $200 per contract gains on those too. We can remain short on /NQ if the S&P (/ES) is below 2,425 and the Russell (/TF) is below 1,410 but we might flip bullish on the Russell at 1,405 if the indexes look bouncy. Trump's appearance at the G20 meeting this weekend was universally reviled as one of the worst foreign policy disasters since Chameberlain met with Hitler yet there's no indication if it in the Futures as we seem to be holding Friday's pumped-up, low-volume gains – so far. ABC's political editor, Chris Uhlmann delivered a scathing analysis of Donald Trump’s presidency during the G20 summit, accusing him of hastening America’s decline as a global superpower and criticised Trump’s presence at the summit in Hamburg, his leadership and use of Twitter, saying his actions in diminishing America are “the biggest threat to the values of the west." 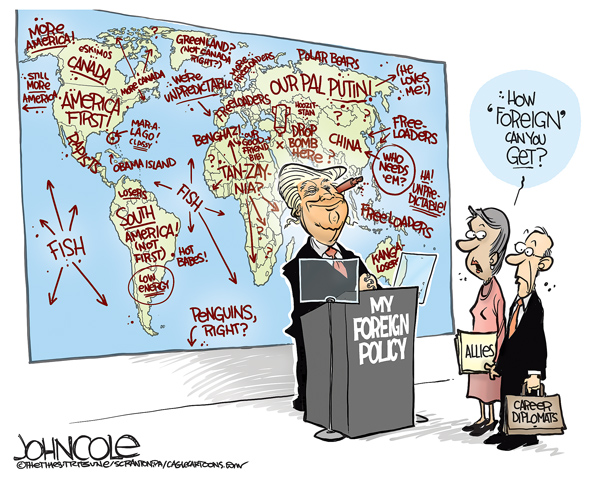 No one at the event was able to disagree as America lost on every possible point while our former allies did end runs around us to make trade agreements with each other now that Trum is questioning our own long-standing trade deals. 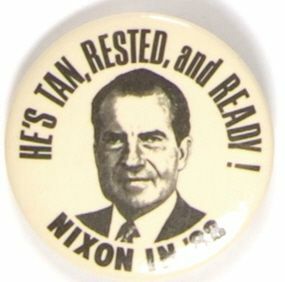 It's been 45 years since Nixon went to China but Trump has pushed American foreign policy back to the stone age in just 6 months, generally to Vladimir Putin's advantage. Putin, for his part, said he would happily accept President Trump's invitation to form a cyber security task force and get to the bottom of who is hacking the elections. He also pointed to the reporters who were in the room for a briefing and said "These are the ones who insulted you?" to which Trump replied "These are the ones, you're right about that" and you can see Putin's man to his left making an ominous list (Putin is known for eliminating reporters who displease him). Thank G20 it’s Friday – Will World Leaders Keep Markets from Collapsing? No, of course they won't. What can the World leaders possibly do to sustain these ridiculously over-priced markets? Things have simply gotten too expensive to buy – as in, there's simply not enough money in the World to buy the S&P 500 for 100% more than it was priced less than 5 years ago. That's 20% average growth in an economy where wages are rising at 4% and GDP is rising at 1.8% which simply suggests that stocks have gotten 100% more expensive for no particular reason. We'll get some more payroll information later this morning but, historically, wages have grown 6.26% annually since 1960 and that INCLUDES the crappy growth we've had this past decade (wages were -5% in 2009, in fact) and the market has grown at about 8.5%. THAT we can accept. It makes sense, more money – bigger markets – sure, we get that. What we have now, however, is a stock market that is outpacting wage growth, productivity growth, GDP growth – pretty much anything you want to measure growth EXCEPT the growth in income of the Top 1%, who are, of course, the primary owners of stocks. Their salaries have jumped about 25% in the same 5-year period but still, even that staggering amount of money isn't enough to justify the 100% rise in market prices. When we say market bubbles, it's not really a bubble. People buy stocks every day and people sell stocks every day and prices go up when the buyers are more enthusiastic than the sellers and vice versa but the problem with that is, when the stocks get very expensive AND the sellers get enthusiastic – it becomes much harder to find buyers and you can get violent adjustments in price in order to satisfy the demand for CASH!!! (have I mentioned how much I love CASH!!! lately?). http://welcome.philstockworld.com/wp-content/uploads/2015/09/PSW-Adooma-logo.png 0 0 Phil http://welcome.philstockworld.com/wp-content/uploads/2015/09/PSW-Adooma-logo.png Phil2017-07-07 12:26:262017-07-07 12:26:26Thank G20 it’s Friday – Will World Leaders Keep Markets from Collapsing? 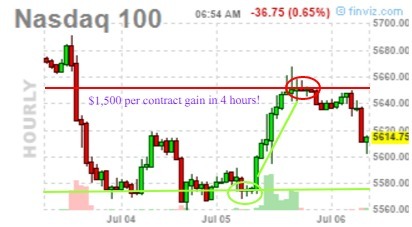 "Our play this morning in our Live Member Chat Room was to go LONG on the Nasdaq Futures (/NQ) at 5,775, expecting at least a weak bounce (and a $500 profit) to 5,600 and maybe a strong ($1,000) bounce to 5,625 because we're still in a low-volume environment, so we're not expecting any major selling just yet." As it turned out, we hit the jackpot with a $1,500 per contract gain and now re-testing the weak bounce line at 5,600 because, as we expected, the volume was nonsense (48M on SPY – less than half an average day) and gains quickly reversed on all the indexes after hours. European indexs are testing Friday's lows this morning as Trump is speaking in Poland and scaring everyone ahead of the G20 meeting. It's not because of anything specifically he's saying – just the general loss of confidence people get every time they are reminded this guy is the President of the United States. I'm in Europe at the moment and generally they see Trump as a joke but they don't think he's dangerous – just ridiculous. If anything, he's helping Europe to feel better about themselves and take charge of World affairs, no longer waiting for America to take the lead. Meanwhile, while Donald Trump is breaking trade agreements, other countries are making them. This morning, the EU and Japan signed a major free trade alliance, shifting even more of the balance of Global Power away from the Unitied States as relationships we worked on for decades are being tweeted away on a daily basis. Among other things, the pact would eliminate duties on cars, agriculture and food imports, as well as other goods and products. This will put US producers at a tremendous disadvantage if Trump can't check his ego and come to the table. U.S. ambassador Nikki Haley told a U.N. Security Council meeting that North Korea's actions are "quickly closing off the possibility of a diplomatic solution," stating the country is prepared to use military force against Pyongyang. Defense stocks could rise again today as President Trump said he's contemplating some "pretty severe things" to retaliate after the isolated regime launched an intercontinental ballistic missile. 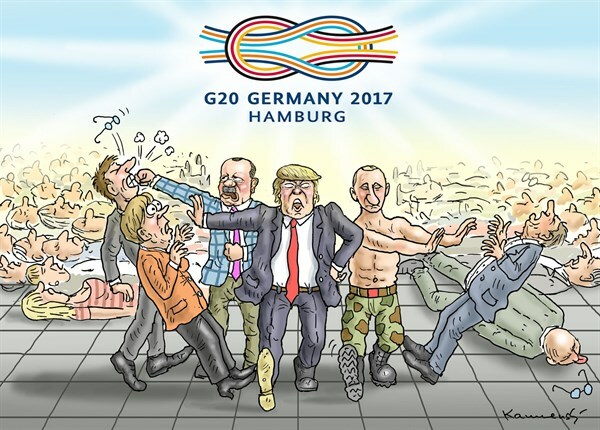 Which Way Wednesday – G20 Time! What a crazy vacation day. 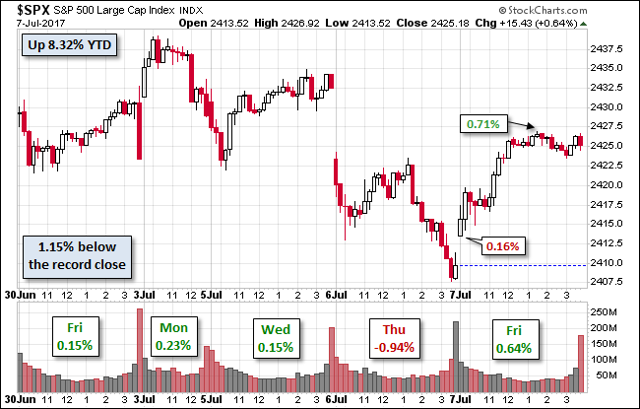 At Monday's close the Nasdaq went wild as a computer "glitch" sent the price of many stocks to $123.47 per share which, in the case of Amazon (AMZN) was a 87% drop, which briefly made us a LOT of money as AMZN is one of our hedges in our Short-Term Portfolio, along with our general hedge on the Nasdaq, using the Ultra-Short ETF (SQQQ). We were also long on Microsoft (MSFT), which went UP to $123.47, valuing the company suddenly at about $1Tn on the 100% instant gain. The Nasdaq says the glitch was the result of "improper use of test data" but, of course, if they were hacked, they certainly wouldn't tell you, would they? In other testing news, North Korea fired a nuclear-capable missile that, in theory, could reach Alaska and that will be used to justify another $50Bn in military spending in order to protect a state we bought for $7.2M and gave us Sarah Palin – I say let Kim Jong Un have it! North Korea will certainly be a big topic of discussion at this week's G20 meeting but it's really the Trump and Putin show we have to look forward to. In other bombshells, the Chinese Government is reigning in some of that free money and is asking for $11.5Bn back from Corporations by the end of next year, which is just a drop in the $162Bn bucket that Chinese companies have been usuing for M&A transactions around the World and it's an indication that the PBOC feels they have begun to overpay for these transactions and this is a "nice" way to review the quality of these loans. http://welcome.philstockworld.com/wp-content/uploads/2015/09/PSW-Adooma-logo.png 0 0 Phil http://welcome.philstockworld.com/wp-content/uploads/2015/09/PSW-Adooma-logo.png Phil2017-07-05 08:09:262017-07-05 08:09:26Which Way Wednesday – G20 Time! I'm not even here, I'm in Paris – it's a holdiay, you know… Americans work way too hard, we don't take enough vacations. America is the ONLY country in the OECD that doesn't have any mandated paid vacations and everyone else, other than Japan, takes AT LEAST 20 days off during the year with France at 31. Not only that but the average Parisiene works 40 hours on weeks they do show up while American workers tend to work 47 hours a week. The really strange thing about this is that America is also the only country where time off is trending DOWN, not up. What's all this talk about automation if we still have to show up for work every day? After making steady progress to about 20.3 days off through 1998, the twin economic upeheavals of 2001 and 2008 dropped the average US vacation time to 16.2 days, that's including our 5 public holidays! The short story is, Americans are generally terrified of losing their jobs so they don't even take the days off they are entitled to. Yes, our Per Capita GDP of $57,000 blows France's $42,000 out of the water but I don't think you'd find many people here who would trade their lifestyles for an extra $13,000 (and all that extra money we make goes towards paying for Health Care and College anyway). Anyway, American's REALLY don't want to get into the GDP measuring game as we fall very far short of other vacation champs like Norway and Ireland ($69,000), Singapore ($87,000), Luxemboug ($104,000) and Qatar ($127,000) and no wonder everyone is jealous of them, right? Luxemborg requires workers to be paid 70% more to work on Sundays and strictly limits the work-week to 40 hours with a minimum of 25 paid vacation days AND 10 public holidays.